It is a telling reflection of our times that art which elevates the mind, engages our finer emotions and awakens us to the presence of the Divine in all things, receives so little attention, both from the art world and the mass media. The mindless mediocrity of a pile of bricks, an unmade bed or a sheep immersed in urine, on the other hand, are hailed as examples of 'self expression', 'individuality' and 'social commentary' by the self-appointed arbiters of good taste and artistic excellence. The reasons for this form no part of this article, though we have explored some of them in a previous discussion on The Magic of Art, to which we refer those readers who are perplexed and repelled by modern art in equal measure. Our present purpose is to introduce our readers to the visionary art of Tuco Amalfi, whose work outside his native Brazil is almost unknown and unappreciated, except by the fortunate Few who have not lost the taste of genuine things and intuitively recognise true inspiration and great artistic talent when they see it. Tuco Amalfi was born in Brazil in 1954 and currently lives and works in the city of Piracicaba, São Paulo. He began to draw and paint as a child spontaneously. His early contact with nature, animals, plants and minerals have remained sources of study and inspiration for him, whose forms he weaves into the symbolic language that is the foundation of his artistry. These forms not only express the Divine in all things, but symbolise specific ideas, facts and philosophical principles and laws. His butterflies are not simply winged children of light, but symbols of the awakening and transmutation of consciousness. The lovely maidens that adorn many of his paintings are not only symbols of beauty, purity and innocence, but of the soul itself, or Higher Self in our terminology. The same applies to all the natural and supernatural elements in his artwork. The stunning interaction of abstract form and colour we behold in his paintings is no less otherworldly than his depictions of strange landscapes, beings and objects. All allude in a symbolic way to the mysteries of sacred geometry and the higher, ethereal realms from which Tuco Amalfi has clearly drawn his inspiration. The theme that runs through all his paintings is light, but light transcendent and eternal, not the transient shadow that illuminates our physical, material world. As we behold that light, something of the inner peace which must have inspired him is transmitted to us, leaving us calmer, happier and perhaps wiser than we were before. Yet there comes a point when words fail to convey what only the heart can comprehend. Like all truly great art, Tuco Amalfi's work can transport us to a place where speech is superfluous and Light alone fills our entire being with its wordless music; a divine language spoken by the dwellers in Heaven, whose golden silence enfolds us in its loving arms: an invitation and a benediction. Tuco Amalfi — The Origin of Myths — 1992, acrylic on canvas. In order to fully appreciate the occult symbolism in Tuco Amalfi's visionary paintings, it is important that we first review the history, development and purpose of symbolism in the visual arts. Symbolism in paintings is not new. In the 4th Dynasty in Egypt, over 5,000 years ago, scenes of sowing, ploughing and harvesting in the wall paintings of that time were intended to convey certain truths. In the Egyptian Book of the Dead we see the same agricultural representations, wherein the souls of the departed are engaged in harvesting the 'corn that grows seven cubits high' in the fields of Ra. These are not earthly fields, for the dramas enacted in the Egyptian Book of the Dead take place in Amenta—the astral world—after the death of the physical body. We may then say that 'sowing', 'ploughing' and 'reaping' are emblematical of the journey that each one of us is making, whether we are conscious of it or not. We all 'sow', in thought and deed, the fruits of right and wrong conduct during our many incarnations on earth. It is these fruits that we see being 'harvested' in Amenta. Similar, hidden meanings may be discovered in every element we see depicted in the tomb paintings of the ancient Egyptians. The geese being fattened in the tomb-chapel of Atet, at Meidum, are no earthly geese, though they are painted with meticulous accuracy. Whether we regard them as emblematical of the soul feeding upon the experience it gained on earth, or as symbolical representations of the 'fattening' of our minds upon the bread of wisdom, they tell a complete story to those who know how to correctly interpret the symbolism in ancient Egyptian art. With the demise of the Mysteries and the ascendency of the Christian Church, symbolism began to disappear from visual art, although it continued to be infused into the geometric masterpieces of Islamic art well into the 16th century, as we can see in the many illuminated manuscripts and glorious mosques from this period of history. With the advent of the Renaissance the purely spiritual component within religious art was diverted (perhaps 'perverted' would be a better word) to secular use. Rather than expressing man's delight in God's work, Renaissance artists were increasingly forced to glorify the temporal power, pomp and dogmas of the Church. Nonetheless, even within these restrictions, the paintings of great artists such as Michelangelo, Botticelli and Raphael still contain symbolic, hidden messages for those who are able and willing to recognise them. 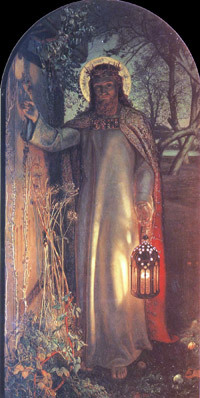 We cannot conclude this section without mentioning the 'Symbolist' movement of the late nineteenth century, which although predominantly concerned with literature and poetry, also influenced several artists, such as William Blake and the Pre-Raphaelite Brotherhood, which numbered Dante Gabriel Rossetti, Edward Burne-Jones, William Holman Hunt and John Everett Millais among its members. The works of these gifted artists are well worth studying. We reproduce Hunt's 'Light of the World' above as an example of the Heavenly inspiration we can find in their paintings. John Ruskin said: "All great Art is the expression of man's delight in God's work, not in his own"; and that: "Noble Art is nothing less than the expression of a great soul; and great souls are not common things". No truly spiritual person would disagree with these fine sentiments, and every genuine mystic will recognise the truth in them. Great art encourages us to rise above the common things of the material world, for by doing so we obtain glimpses of the higher realms of the spirit. From this it follows that great Art, in whatever form, is the result of attunement with the Higher Realms and Beings; realms where all is Peace and Beauty, peopled with inhabitants who have for ever left the lower spheres of materialism and ugliness, but who send out their thoughts to the lower planes in order to arouse mankind to a proper sense of the grandeur and glory which awaits us all—if we wish—by means of the Inspiration which the great artists receive from on high. It is the Higher Realms which are the reality for the inspired artist who delights in God's work and not this transient world of earthly illusions, and it is these higher realms which the God sent artist reveals to us in his art. It is the duty of Art not to waste its high capabilities in the imitation of the trivial and commonplace, and in the curious adornment of that which has only a finite significance. The highest Art is always the most religious; and the greatest artist is always a devout man. Who could conceive a Leonardo da Vinci, a Raphael, a Rembrandt as a scoffer, a sneerer or an atheist? It is impossible to imagine such a contradiction, and this law applies to all great souls; whether they are aware of it or not; for behind their outer activities is concealed the inner conviction that tells them of their high descent from the Realms of Light. Great art, and especially sacred and visionary art, has the power to exercise and gratify the nobler and better parts of human nature, the imagination and the judgement, love of emotion and reflection, the enthusiasm and the critical faculty, the senses and the reason. For without any of these—and especially the higher emotions, whatever their form or nature—the study of the occult mysteries is a complete waste of time, for the true secrets of man and the universe can never be revealed to the cynic, the emotionally stultified or the carping critic. Such belong to the lower realms, and the Book of Wisdom is a sealed volume to them, for its seals can be melted only by the warmth of the flame of Inspiration and Enlightenment, the love of Beauty and Goodness, and by attunement with the Light that descends from the Realms where these Blessings are enthroned in lustrous Splendour. Art may be symbolical of many things and conceptions. Gothic art is imitative, Greek inventive and Byzantine composite. Ancient Egyptian art, as we have seen, is thoughtful, mystical and allegorical, enshrining the highest Truths in emblematical form. Oriental art is enriched and idealised by fancy; and though Ruskin said that it had lost its symbolic character, he did so because he was no occultist and could not interpret its hidden meanings. Islamic art, as we discussed above, combines the poetry of geometry and mathematics in radiant colours, as varied and changeful as nature. In contrast, Gothic art is subdued, monumental, and defined by strict rules of weight and volume. Hindu art is varied and strange in its complex and studied intermixtures, each carrying a message to those who can read its enigmas. The art of Persia is the most graceful and poetical of all Oriental artwork; gorgeous and yet delicate in colour, filled with the broadest effects of contrasting hues, and wreathed and blossomed with threads of foliage and flowers. So much for the truly great and sacred art of the past. What of the present? If you are honest you will admit that it falls far short of the ideal discussed above. One of the latest concepts of the criticism of Art is that it is necessary to discover how far a work of art was conceived in response to free impulse, or aesthetic impulse, and how far it was concerned with biological or business ends in view. If you have followed our discussion with full attention you will vehemently deny the term 'art' to anything that is used to glorify man's achievements, however highly the world may regard them. You will, we hope, also recognise that anything which is used for 'business' exploitation ceases to be art and becomes commerce. Before America had discovered the hypnotic influence of pictorial images on the public, the man of business had nothing to say to the artist, with the sole exception of the portrait painter who was able to minister to his egoism. Nowadays, many artists minister to their own ego, as we mentioned in our introduction when we referred to the 'art' of unmade beds and piles of bricks. 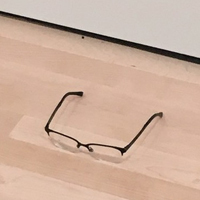 Quite recently, an American schoolboy left a pair of spectacles in an art gallery as a prank. Within minutes, visitors were commenting on this latest 'exhibit', speculating on what it might 'mean' and its 'social relevance.' We need to jettison such notions if we wish to understand and appreciate Sacred art. The inspired visionary artist has always been a transmitter of the Divine Truths, no matter how he or she chooses to represent them. To understand their art we must be able to attune with either them or the source from whence they derived their inspiration. We can do this by sinking our whole mind into their paintings in silent meditation and suspending all intellectual thinking. For great art speaks directly to the Higher Self, without words—if we let it. The unevolved, on the other hand, can never do these things. By the unevolved we mean not only those who find their delight in piles of bricks or unmade beds, but also the critics who dismiss visionary painting as so much self-indulgent twaddle which is completely irrelevant to the modern world. It may be irrelevant to their world, but as we said earlier, it is vitally important to the inner and outer world of the student of the occult sciences. 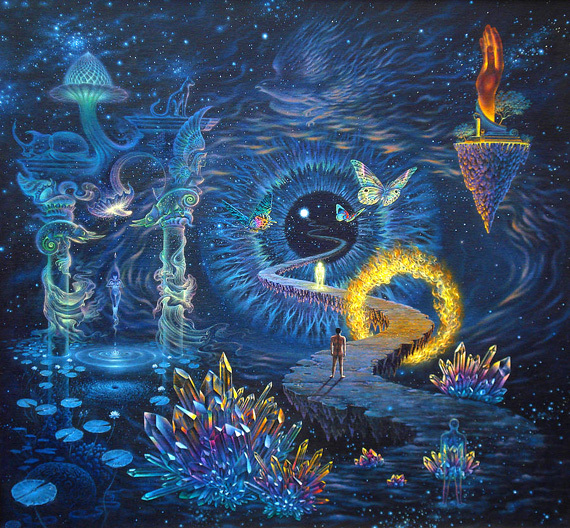 Visionary art has the power to transform our lives in many positive ways, leading to a deeper understanding of the universe and our place and function within it. If that is 'irrelevant' to some, it is they who are the poorer for ignoring and disparaging the deeper meaning and higher purpose which could improve their lives. Tuco Amalfi's paintings are filled with meaning and purpose, as we shall discover. But it is not our intention to play the critic, for that might prejudice you in favour of our interpretations, rather than your own. For, as we point out in so many of our articles, it is vitally important that the occult student learns to think for and by himself, and he cannot do this if he is constantly referring to the opinions of others, however wise they might be. Consequently, we will confine ourselves to a brief commentary upon each of the paintings we have chosen to review and leave you to discover more in your own way at your own pace. These three paintings depict the ideal beauties of Nature such as are rarely found on earth in all their pristine loveliness, but can be seen in the higher, non-physical, but still material, realms which surround our world. We say 'material', for as we point out in our occult studies course article on the astral world, these realms or planes are just as 'solid' to their inhabitants as our world is to us. The difference is that there is a greater intensity of light in these higher dimensions and everything we see there is radiant with the living fire of Life, giving an added beauty and lustre to the trees, flowers, insects and birds, such as we can see in these paintings. 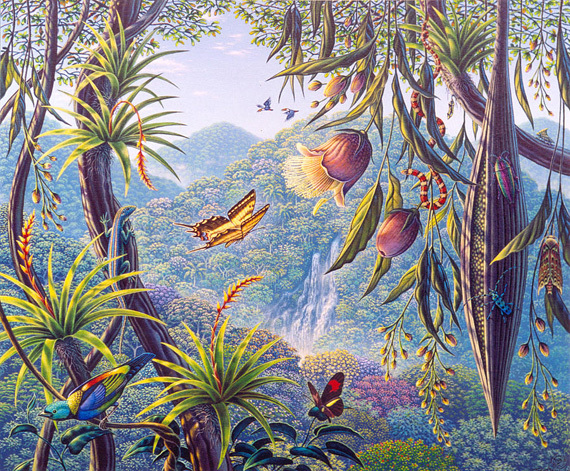 More wonderful still, in the highest realms of the astral world, such as J Michaud describes in Vision 6 of The Golden Star, we are able to communicate with the flowers, trees and insects to share our mutual love and adoration of the Creator. It is quite impossible to describe the effect that this wordless communion of consciousness has upon the Higher Self of those who penetrate into these sublime regions, except to say that it is a blessing beyond all price. We are not sure what the artist means by 'man', 'soul' and 'conscience', but it may not be wrong to correlate these three principles with the physical body, the Higher Self in its astral body and the Vital Spark of Life. In our occult studies course article on the Soul, the writer relates his own personal experience of seeing these principles during meditation, the three forming a triangle with the Spark at the apex. At the end of his account, he asks: "Now what was it that was watching my body, the astral or psychic shape beside it, and that blazing, golden ball? It was the real 'me', my soul, fully conscious..." He goes on to add that: "The Soul hovered over this triangle and knew all things with a large and terrible awareness, and that body was me, that shape was me, and that ball of fire was me, all alive and conscious, but that which watched those three parts of me was the greatest part of all." Read that account, if you have not done so before, and try to link it up with what you see in this painting, for in this way your will gain a deeper insight into what the artist has tried to convey. This delicate depiction of the manifestation of new life in the form of a human child cradled in the protecting petals of a rose needs no comment, except to say that it illustrates perfectly the three principles we referred to in our previous commentary. This painting is reminiscent of the illustrations made by Ethelwynne M. Quail of Devas and nature spirits for Geoffrey Hodson's Kingdom of the Gods in which he describes the inhabitants of the four occult elemental kingdoms of Fire, Air, Water and Earth. As such, it is an accurate representation of what such beings look like to those who can see them clairvoyantly. 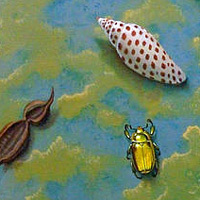 This enigmatic painting reminds us of the words of that truly great occult scientist, Sir Isaac Newton, when he said: "I do not know what I may appear to the world; but to myself I seem to have been only like a boy playing on the seashore, and diverting myself in now and then finding a smoother pebble or a prettier shell than ordinary, whilst the great ocean of truth lay all undiscovered before me." Is this what the lovely maiden in this picture is thinking? Only the artist knows, or perhaps he does not. What we can say is that those of us who are on the path to the Light know that it is invisible to all but ourselves. For no matter how many loving hands may stretch out to us along the way, it is only our own two feet that can carry us to our destination. 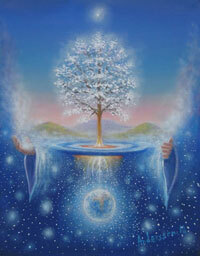 If there were only one message in this painting that we would wish to commend to you it is Inner Peace. Though the sea is in motion and the lady is walking, they seem to be embraced by an utter calm and stillness which makes us catch our breath and simply gaze in wonderment at the glorious scene before us. This enchanting tapestry of allegorical elements is more than a metaphor for man, more than a glyph of the Kosmos and more than a depiction of the path to liberation and enlightenment, though it expresses all these things too in its manifold symbolism. For Man is the image of the Kosmos, and the Kosmos is imaged in him. In the foreground we see the transparent outline of a man standing amidst glowing crystals. On the left, we see lotus leaves floating upon the waters, while all around are strange animals, butterflies, birds and fish. Was the artist thinking of the occult maxim that states: "the Breath becomes a stone; the stone, a plant; the plant, an animal; the animal, a man; the man, a spirit; and the spirit, a god"? It would seem so. Perhaps too, given the number of fish in this painting, he was thinking of the description of the birth of the Kosmos given in the Secret Doctrine, in which we may read: "The Mother is the fiery Fish of Life. She scatters her spawn and the Breath (Motion) heats and quickens it." There are simply too many elements in this painting to review them all, but we cannot conclude this commentary without mentioning the conspicuous ring of fire that encircles the winding path that leads toward the distant star placed within the central eye. This not only reminds us of the entry of the liberated Higher Self into heaven described in Vision 6 of The Golden Star mentioned earlier, but the Divine Fire which is in everything. Whoever has read the beginning of The Golden Star, or lost themselves in awed contemplation of a glorious sunset or sunrise, will recognise the messages in this luminous painting. Radiant white lilies adorn the foreground, beckoning the pure in heart and mind to ascend the stairway of the gods to a better land. See how the Hawk of the liberated Self soars towards the setting Sun. Not for him the gold-capped towers and gorgeous palaces, lovely as they are in their translucent traceries of green and blue, for he knows that even they must fade away in time. But the Light toward which he wings his graceful flight endures for ever. Such are a few of the golden words this lovely painting speaks to us. With that final commentary, we must end this all too brief appreciation of the art of Tuco Amalfi. If it does nothing more than encourage you to look at his inspired paintings with a seeing eye and understanding heart, we shall be well content. If you have enjoyed this article you may also like The Magic of Art in which we investigate the magical power of art for good and evil. © Copyright occult-mysteries.org & Tuco Amalfi. Article added 23 June 2016. The images reproduced in this article are the copyright of the respective artists who created them or their heirs or publishers. We believe that our use of these images constitutes 'fair use' for non-commercial and educational purposes under the terms of UK, US and international copyright laws. In this afterword we examine the phenomena of visionary art in order to learn the differences between visions of truth and light and fantasies of delusion and darkness. Tuco Amalfi, whose paintings we discussed in our article, had this to say about Art: "Art is a gift from God and should be done for His glory, to enlighten, inspire and to call people to a state of contemplation, so that they can experience the peace which emanates from the same source that we all have inside us. 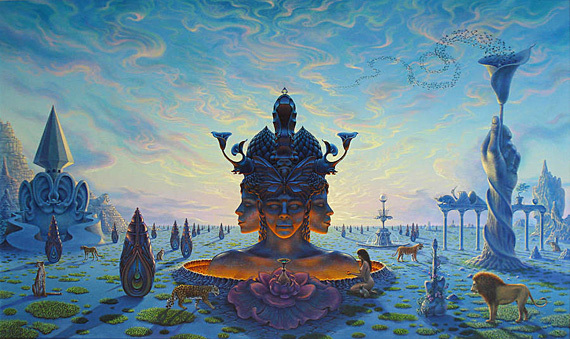 Visionary art is not surrealism or fantasy, it's a mission where the artist acknowledges, searches and allows divine inspiration to perform the work beyond ego, beyond the latest trends or influences, to awaken in people the infinite within themselves. The function of art is not to portray things, but rather to reveal the divine essence in them." These words sum up what visionary art should be, but so often isn't. It also alerts us to the fact that not all art glorifies God, nor does all of it come from the Realms of Light. Just because something is called 'spiritual' does not make it good or wholesome. Spirits can be evil as well as good. Mad people see visions too, as every psychologist knows, and it is vitally important for those of us seeking truth to learn to distinguish the different types of visions and recognise where they come from. We need hardly add that our baser emotions are the polar opposite of these virtues, such as hatred, lust, selfishness, revenge, intolerance, cruelty and ignorance. Art which glorifies any of these vices, or depicts them in any form cannot be regarded as good. This must be evident to all right-thinking people. The same is true of art that is chaotic, discordant, depressing, frightening or distressing. 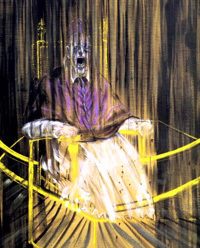 Edvard Munch's famous painting of the 'The Scream' is an example of this kind of art, as is Francis Bacon's 'Screaming Pope', both reproduced below. 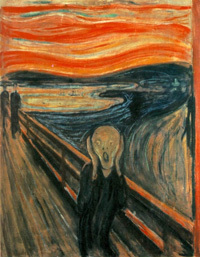 It is no coincidence that Munch and Bacon were both manic depressives with suicidal impulses, suffered frequent hallucinations and engaged in prolonged bouts of alcoholism. These two paintings illustrate our first principle, which is the effect art has upon our emotions. Whilst we would not wish to encourage you to spend any appreciable time looking at them, it is important to understand the negative influence they exert and so learn to recognise it whenever and wherever we encounter it. It is a well-established scientific fact that negative thoughts attract negative conditions, just as positive thoughts of good will bring about happiness and content. The so-called 'Placebo' effect in medicine is a well-known example of this law. Although we do not know from whence Munch or Bacon obtained their inspiration, it must be clear to you that the Divine is wholly absent from their art and that it appeals only to our basest emotions and fears and anxieties. Do we really need to be reminded that this world is often confusing, frightening and depressing? Do we not all know that man's cruelty, greed and selfishness are limitless? Are we not daily bombarded by every conceivable media with the worst in mankind? If we dwell upon all these horrors, we not only draw them towards us but increase them. Is that what we want? Let the exponents of 'realism' in art answer. This illustrates our second principle, which is the effect art has upon our thinking. Our third and final principle is the effect that art has upon the soul, or Higher Mind in our terminology. In other words, the part of us which is Divine and has incarnated in a physical body to learn the lessons of material existence. One of these lessons is discrimination; learning to discern light from darkness, truth from lies, good from evil, and right from wrong. 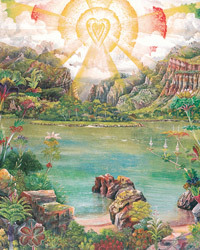 Having learned from Munch and Bacon that fantasies and delusion lead us into darkness and away from truth—if we allow them—let us now contemplate true beauty as depicted in the visionary art of Joseph Parker (1930-2009), whose paintings illustrate the three principles we have discussed. 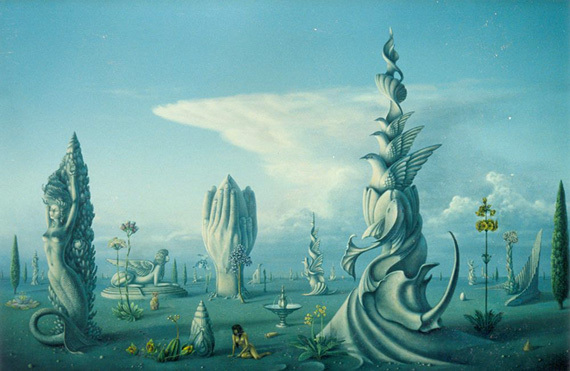 Parker has been described as the 'grandfather of visionary art' and whilst his mystical landscapes have inspired many imitators (both good and bad), none have managed to match the innocence and purity of his sublime artworks, which are truly portals to the Higher Realms of Light. Parker said of his art: "Attaining the mountain top has a spiritual meaning as follows: All human souls on this planet are in a school of learning to perfect themselves in order to attain a higher state of being. I have painted the mountains very steep because as the soul masters the difficulties on the path, more difficult tests lie ahead. 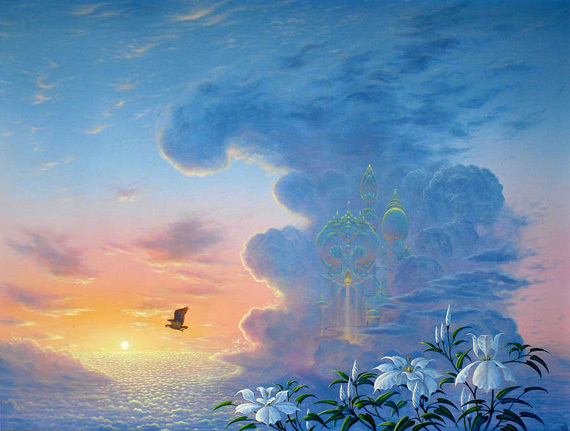 Once the soul reaches the peak, it attains what the Buddhists call Nirvana. 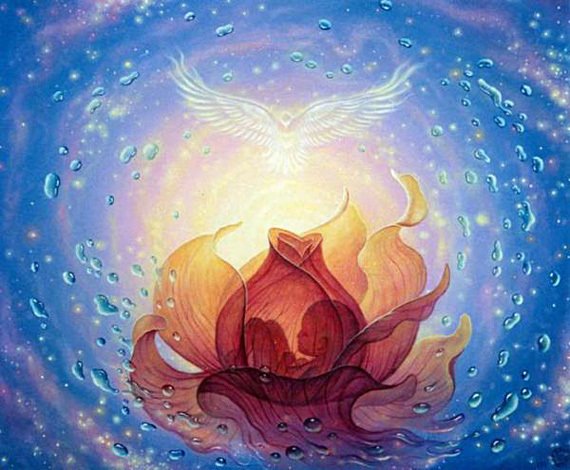 Then the soul does not need to be reborn, but continues its evolution in the Spiritual Sun." This, we need hardly add, is also the doctrine of occult science as you can read in our many articles. 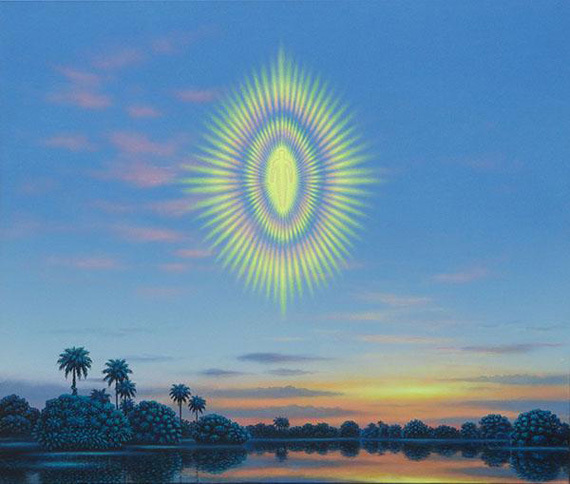 In the two examples shown below we see Joseph Parker's personal interpretation of the spiritual sun as he glimpsed it during a moments of spiritual exaltation and reproduced it in his paintings. We emphasise 'interpretation', for no two seers ever behold the Higher Realms in exactly the same way. This is because no two minds are the same or think the same. All that we behold, both in vision and in our waking life is the realisation of our senses. Unless we have been taught the occult scientific laws that govern the appearance of things, whether in this world or in the astral world, and how to apply those laws to what we see and experience with our senses, we are liable to fall into error. 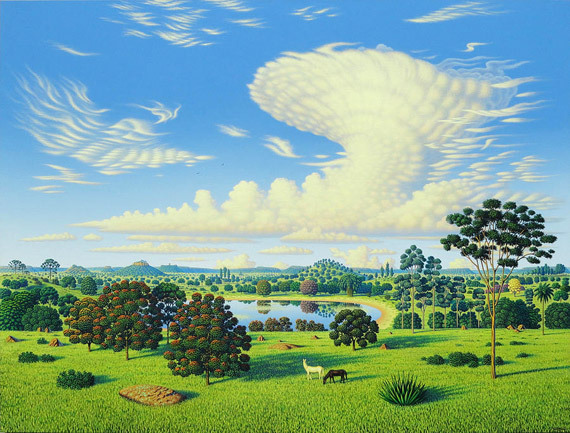 Yet however varied the interpretations of the Higher Realms may be, they remain the same for all genuine seers in their endless loveliness and glory, as we can see in Joseph Parker's painting. You can see larger reproductions of his work at occultsciences.org. 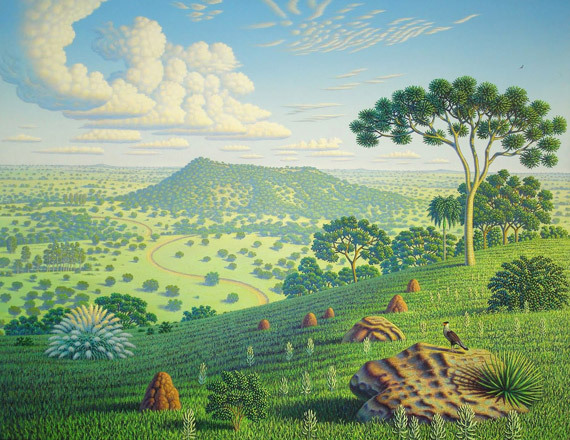 Another, little-known visionary artist, is the Swedish painter, Benny H. V. Andersson, whose work can be viewed on his personal website, as well as in many galleries around the world. He refers to his art as "visual prayers—a reminder that it is by the grace of God that I am alive and can create and share my art." We reproduce one of Andersson's paintings below. Every truly inspired artist has acknowledged the Divine source of their gift. 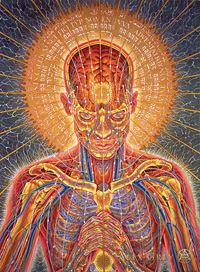 Whilst it is easy to distinguish the differences between the uplifting paintings of Parker and Andersson and the nightmarish visions of Munch and Bacon, this becomes less so when we consider the work of artists such as Alex Grey—currently the most popular and highly regarded exponent of modern visionary art. As you can see from the example above, Alex Grey's paintings have more to do with the fantasies induced by hallucinogenic drugs like DMT than genuine spiritual vision. There is nothing remotely Divine in this picture, ironically entitled 'praying'. If this is the artist's idea of prayer we want nothing to do with it! Although our reproduction is small, one can clearly see that this painting is firmly of the earth, earthy, though the colouring and halo around the head may delude the uncritical viewer into thinking it is 'spiritual'. Well, it may be, but as we said earlier, there are good and evil spirits in the non-physical dimensions of the astral world, and we are quite certain which kind this painting evokes. Like many artists of his generation, Tuco Amalfi admits that in his teenage years he experimented with hallucinogenic drugs. 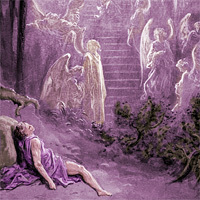 But, like most young people he soon learned that drugs are not the way to obtain visions of the Higher Realms of Light. Whilst drugs such as LSD and DMT can and do separate the mind from the body, they do not confer either enlightenment or spirituality, for that can only come from God and not from man. At best, drugs provide a glimpse, often chaotic and confusing, of the non-physical side of this world, and at worst the lower regions of the astral world, from which artists like Alex Grey draw their inspiration. changing spiritual transformation after he gave up his drug use. In both cases, entering into a condition of silence and inner peace was the catalyst that changed their lives. 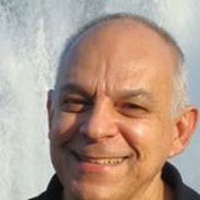 Tuco Amalfi confirms this in his biography when he writes: "what I had previously sought through drugs outside myself I discovered inside me—in my spirit that comes from God and is part of it. As my awareness of the light within me increased, so did the silence and peace I experienced, and I found out that it was the real source of my visions and perceptions." Contrast this with Alex Grey's thoughts about art. "The purpose of truly transcendent art is to express something you are not yet, but something that you can become." Or: "I felt I had dissolved into a pure energy state and become one with the magnetic field surrounding the earth." Remember what Ruskin said about art, whose words we quoted in our article at left: "All great Art is the expression of man's delight in God's work, not in his own." It is clear from this that Grey's art, despite his grandiose claims and talk of 'God', is firmly embedded in the material world and the modern cult of personality. This is evident from our second example of his work, shown below. 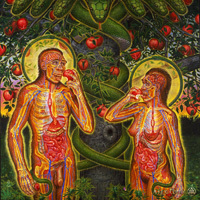 In this painting we see 'Adam' and 'Eve' in the Garden of Eden, with every internal and external feature of their anatomy picked out in meticulous detail. Whether Grey deliberately set out to materialise the allegorical mystery of the creation of Man, we cannot say, but in doing so he has gone one better than the Hell-Fire preachers of the Church ever did with their emphasis on the 'original sin' committed by our Divine Parents and the 'curse' placed upon them by the vengeful 'god' of the Old Testament. Let us say at once that Grey's literal interpretation of the story of Adam and Eve, like that of the Church, is completely false. What this allegory really means, you can discover for yourself in H. P. Blavatsky's Secret Doctrine; we have neither the space nor the inclination to explain it in this afterword. This may explain why Alex Grey is a follower of the Vajrayana school of Tibetan Tantra, wrongly called 'Buddhism' by those who know no better. Vajrayana is a Sanskrit word meaning 'thunderbolt vehicle', though it is usually (and misleadingly) translated as 'The Diamond Vehicle.' Vajrayana emerged in India in the 5th century A.D., as an offshoot of Mahayana Buddhism, and quickly became the dominant religion in Tibet. Opinion is divided on where it first arose. Some believe it originated in Bengal, now divided between India and Bangladesh, while others claim it originated in the modern day Swat Valley in Pakistan. Regardless of its origins, Vajrayana is essentially a Tantric doctrine which advocates the use of various sexual practices to develop so-called 'elevated' states of thinking and provide a short-cut to enlightenment. As we explain in our article on the dangers of Shamanism there are no shortcuts to enlightenment. Frankly, the employment of sexual practises for spiritual ends, no matter how much they may be disguised in mystical language, is black magic, and rightly condemned by every genuine spiritual teacher. We hope it is clear to all our readers that liberation from the bonds of the flesh cannot be obtained by indulging the desires and appetites of the flesh. "I had a vision of the group soul of humanity as a perfectly circular pool of intense living light. All around the rim of the milky pool were a complex variety of sexual rites, a metaphor for all social interaction. Translucent Hindu deities swooped over the group taking the excessive energy of the shimmering pool and passing through the group as ecstasy and pain. I saw that the reason we were all brought together was to provide a psychic energy feast for the Gods and Goddesses. I saw my heart as the axis of karmic, earthly, and universal energies, transected by and uniting the polarities of male/female, birth/death, good/evil, and love/hate. To maintain a balance of forces we all fed both Deities and Demons." If Mr Grey wishes to be 'fed' to Tibetan demons that is his prerogative and we have no desire to dissuade him from providing a tasty morsel for them. But if you have followed our discussion with care, we hope that you will decline his kind invitation and dine instead upon the heavenly food of artists such as Joseph Parker and Tuco Amalfi. If you do, you need not fear being misled by the false visions of the pretenders to Truth and Imposters of Wisdom. You can read the true facts about Tibetan Vajrayana Tantra and the dangers it poses for those who involve themselves with it in our in-depth investigation of the origins, history, teachings and practises of Tibetan Buddhism. 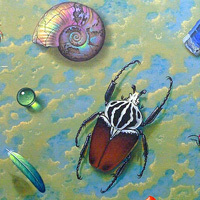 "I still remember a sense of wonder and surprising mystery that left me stunned and fascinated in my childhood when I encountered beetles with bright and iridescent colours." 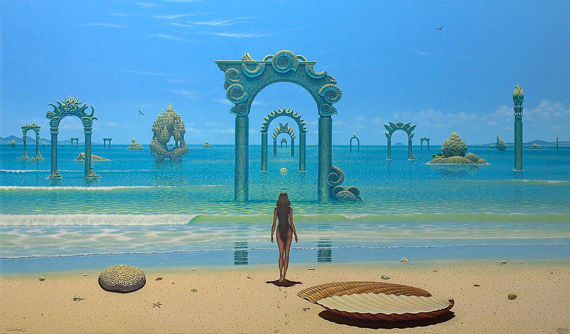 You can find more visionary art by the artist on his own personal website, on his Facebook page and at occult sciences.org, which also displays the work of other visionary artists.